Origin and Habitat: Tulista opalina is known only from one single hill on Brandrivier farm between Garcias Pass and Barrydale, north of the mountains in the Little Karoo, Republic of South Africa..
Habitat and ecology: This species grows extremely well hidden in the close company of Haworthia obserata, which is known from this area and equally rare. In the same locality grows Haworthia arachnoidea var. nigricans, Haworthia multifolia and Astroloba corrugata. Natural hybrids of opalina and corrugata were reported from here. 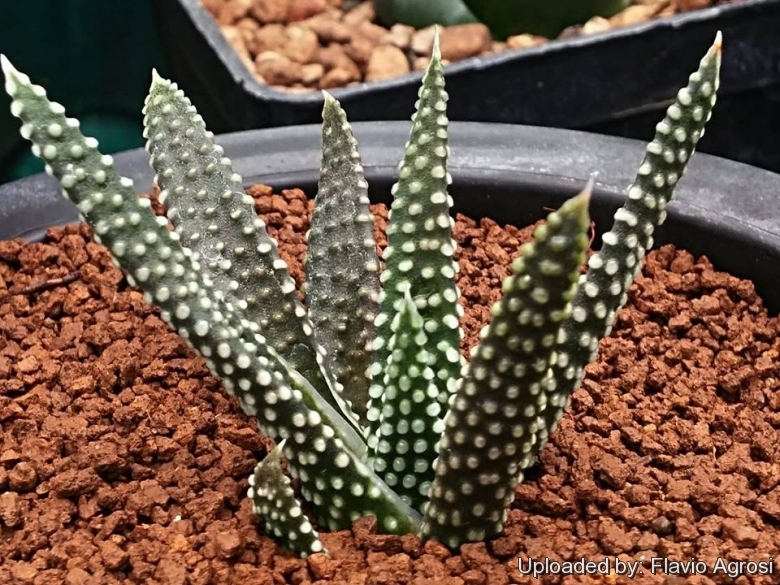 Description: Haworthia opalina (Tulista opalina) is one of the most attractive plant in Haworthia group. It is rare and fascinating in one hand and subject of misinterpretation in the other hand because at first glance the plants are somewhat similar to Haworthia minima, but it is quite a large growing plant with rosette up to 12-15 cm in diameter. Long minima-like leaves are covered with dense glossy and transparent tubercles. Colour is light green. It shares the feature of having small and densely arranged tubercles on the leaves with Haworthia minima, but flower types and shape of fruits are much more like maxima than minima. It is also much closer linked to Haworthia maxima in terms of geographic distribution. The tubercles of Haworthia opalina have a glossy and transparent appearance while the tubercles found on the general Haworthia minima plant are more opaque-white in colour. Haworthia minima is also more regularly inclined to cluster while H. opalina plants remain mostly solitary. The flowers of Haworthia opalina have the same rather thick perianth tube and swollen base as that of Haworthia maxima and the fruits are identical to the short and smooth globose fruits as found in Haworthia maxima. Derivation of specific name: "opalina" for its tubercles remembering of an opal, a gemstone typically semi-transparent and often marked by iridescent play of colours. Cultivation and Propagation: Tulista opalina is quite slow grow species, first flowering occurs after 6-7 years in cultivation. Propagation must be done by seed.